HomeThe Spicy GirlsThe Spicy Girls | Back at the Corner Hotel! This is the ultimate 90’s Party! 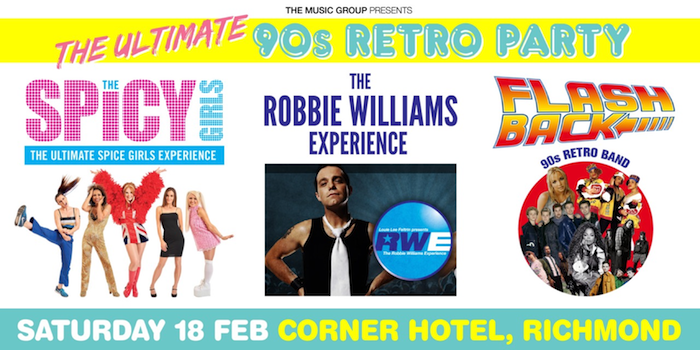 The Music Group are proud to present ‘The Ultimate 90’s Experience’ at the Corner Hotel, Richmond on Saturday the 18th of February 2017. 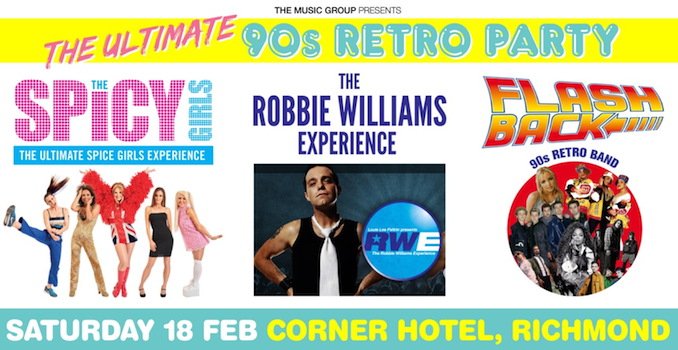 Featuring three premier TMG acts – The Spicy Girls, The Robbie Williams Experience and Flashback, this is set to be a huge show and the perfect night out for any discerning 90’s music fan. The Spicy Girls last appeared at The Corner in front of a sold out crowd back in July 2016 – and what a night it was! They’re very excited to be back where it all started. This time they’ll be joined by the one and only Robbie Williams Experience featuring Louie Lee Feltrin. Making his mark around Australia as one of the cheekiest performers ever to grace our stages, Louie presents his acclaimed Robbie Williams Experience with all the charisma, charm, fun and excitement that makes Robbie one of the most popular male artists of all time. A must see for all 90’s kids. Make sure you grab a group of friends and come along to see some of the best bands Australia has to offer playing all the biggest 90’s hits in one night! If you’re searching for an act for your next corporate event or function, then this is the perfect opportunity to see three of The Music Group’s fantastic acts in one night!